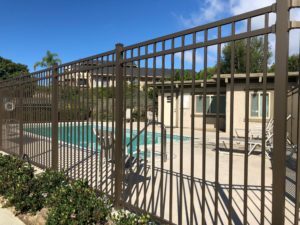 At Saddleback Fence and Vinyl Products, we offer ornamental steel and aluminum fencing that raise the bar when it comes to quality and durability. These fences are designed to be stronger and longer-lasting than other types of steel and aluminum fences in the industry. All of our products are manufactured in the United States and warrantied. If you are in Orange County or a surrounding area such as Long Beach or Palos Verdes, you should check out our selection through our online steel/aluminum fence gallery or in our showroom! We are an Orange County vinyl products supplier that offers a wide range of fencing option. We carry ornamental welded/ bracketed steel fences called Secure Weld Plus. The coating used on these fences is the very same electrocoating (e-coating) process that is used by the automotive industry. Because of their coating treatments, Saddleback’s steel fences have a much greater level of protection against corrosion. We offer Alumi-Guard’s aluminum fencing, which is a line of ornamental fences that are known for their strength, low level maintenance, and aesthetic appeal. If you would like to learn more about our superior steel and aluminum fence products, come visit our large Orange County showroom! Call us today at (888) 498-4695 and ask for a free estimate.